Are you a yogurt or cheese maker and have lots of whey available? If so, you might need to know how to make Homemade Ricotta Cheese Using Whey Drained From Yogurt. It’s really simple. Grab a half gallon of whole or 2% milk along with a couple cups of whey you’ve saved from making Greek yogurt. Whisk together in a saucepan and heat on top of the stove without stirring. Heat milk and whey mixture on top of the stove over medium heat. 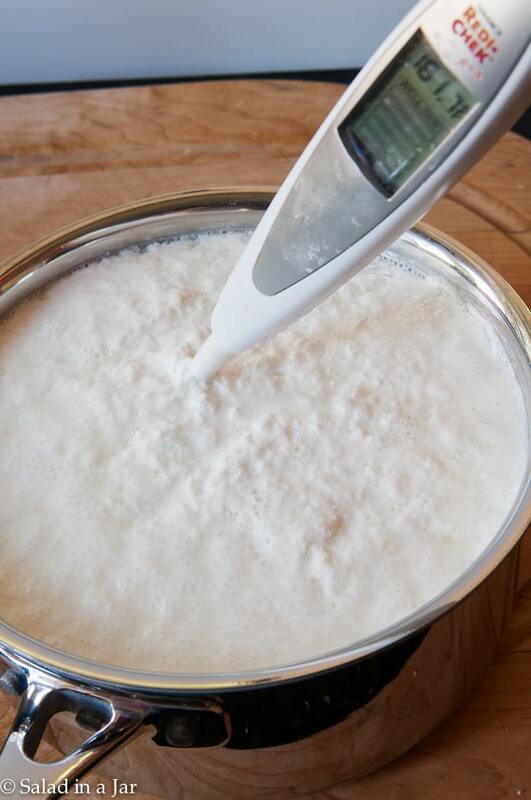 As milk mixture heats, you will see the milk begin to curdle and separate into curds and whey. Remove from stove when temperature reaches 180 degrees F. Allow to sit for 15 minutes. 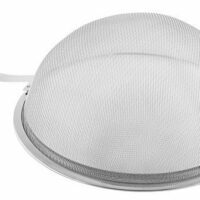 Separate the curds from the whey by using a fine-mesh strainer. 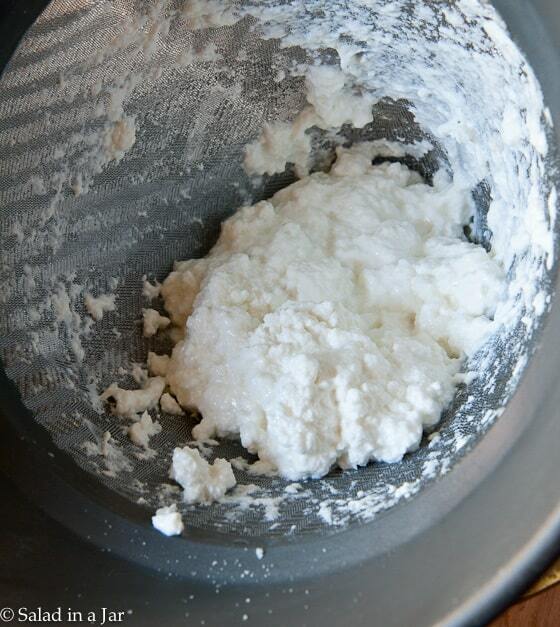 Use a slotted spoon to remove curds to a fine-mesh strainer. Let ricotta drain to your preferred dryness. Season with a pinch of salt. Easy. Right? Store in a glass bowl or jar in the refrigerator for 4-7 days. 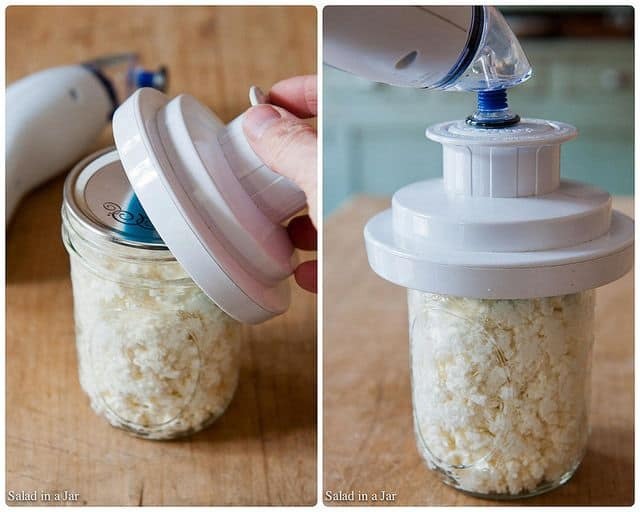 If you are a vacuum-packer (you know who you are), vacuum-pack the finished ricotta in a Mason jar and double the storage time to approximately 2 weeks. p.s. Some people suggest you can make ricotta cheese by boiling the whey by itself so I tried it. It’s too much trouble! It takes a VERY large amount of whey to produce a VERY small amount of cheese. 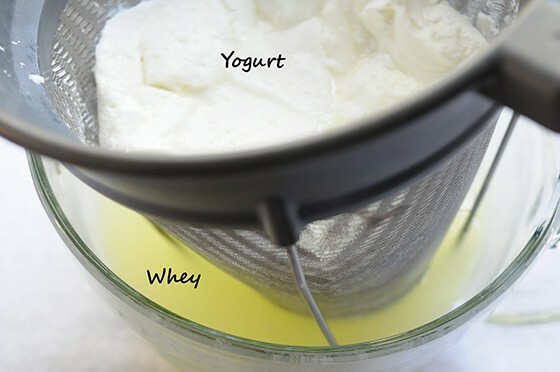 Most of the protein is removed from the whey in the yogurt-making process, unlike the whey one collects from making cheese. That’s my experience anyway. Stir milk and whey together in a large saucepan. Heat on stove to 180 degrees. Milk will curdle. Remove from stove and allow to stand for 10-15 minutes. Gently retrieve curds from pan using a slotted spoon and place into a fine-mesh strainer or use whatever strainer you have, lined with two layers of cheesecloth. When curds have drained to your preferred dryness, store in a glass or plastic jar up to 4-7 days. 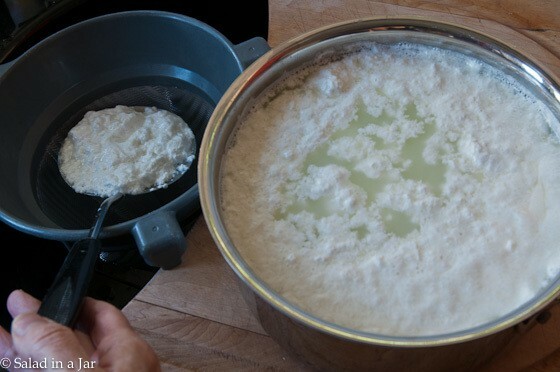 I like this simple way of making ricotta from leftover whey. Mine didn’t yield 2 cups of ricotta, maybe half of that. Can you tell me if my whey isn’t acidic enough; other explanations? Any help you can give me would be appreciated. Thanks for writing. The two cups is not right. My mistake. I usually get around 1-1/4 cup of ricotta cheese with this method. It can vary some according to whether you use 2% or whole milk. If there is a difference in acidity from one batch of whey to the next, I don’t know it. 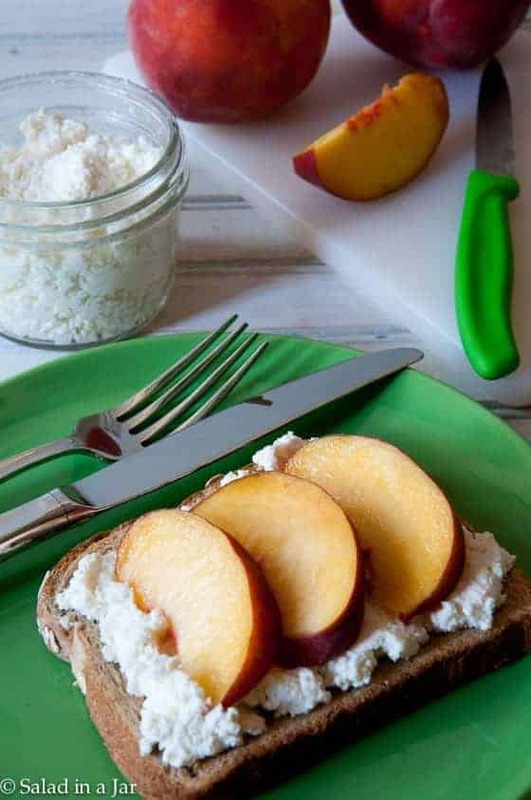 I have tried several recipes to make ricotta from whey and this is by far the best and easiest. I have made it several times and last night I made a mistake. I accidentally left the mix on the stove once while I went to grab a pan from the garage. By the time I came back in the mix was boiling (and popping due to the curds) and far about the 180 degrees called for. I removed the pan and scooped the contents into my yogurt bag and the cheese was just as good as any other time I made the ricotta. I would not recommend forgetting your mix and letting it boil or get too hot but it is nice to know that should “life happen” this method is forgiving. Thank you for sharing! I started making yogurt according to the instructions, first heating 8 cups of milk then letting it cool. I have found that using nonfat, Store bought milk, can be used right from the refrigerator no heating necessary I stir in 1/4 cup starter yogurt set the yogurt machine for 12 hours and it is done. The yogurt comes out so creamy and good. If I strain the yogurt 12 to 14 hours it is thick and creamy no tartness, you can eat it with a spoon right after straining. 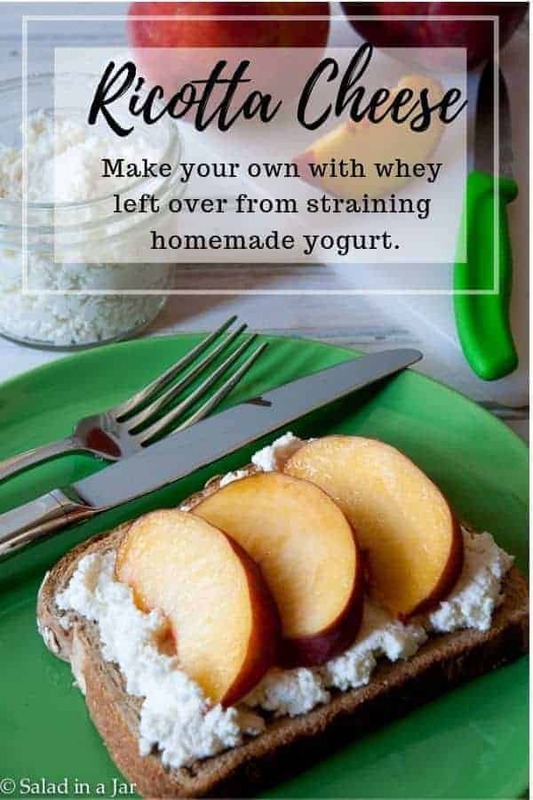 Hi, I’d like to try this as we always have lots of whey left over after clabbering raw whole milk. However, I’d also use raw milk to make ricotta – to preserve the live bacteria and enzymes – so is it necessary to heat raw milk to 180F or would 100F suffice? Uh huh…. this didn’t exactly get rid of the whey left from making Greek yogurt. After starting with 8 cups of milk (1/2 gal) and 2 cups of whey, one ends up with the close-to-but-not-quite-yet-useful ricotta-type cheese…..and 3+ cups of whey! Love this site…I don’t know how you gals have the time to do all that you do. One part of the Greek yogurt process I hated was the heating of the milk and then the cooling down. I found that by adding powdered milk, you are increasing the protein enough that you don’t have to bother with the rest of that. About half a cup of powdered to one quart or even 5 cups of milk. Hi Marilyn, Great idea if you don’t mind the slightly different taste and texture you get with the powdered milk. Glad you found a way to do it that works for you. Can I keep the whey leftover from making ricotta? Will it still be useful? I want to use it to make some sauerkraut. Not sure. I haven’t tried it. Let me know if you do. Ricotta cheese is made with whey (as the main ingredient) left over from the production of other cheese. In this case you are using whey to acidify whole milk. Can’t wait to try this. Is it possible to use fat-free or 1% milk, or is more fat necessary for the cheese making process? I use fat-free milk (sometimes 1%) to make the yogurt. I tried this with my favorite fat-free milk and it was not so good—a little chewy. May try again in the future but my first attempt wasn’t great. Yes, your method works great, as you know. My method is no more trouble IF…you already have the whey, which many of us do who make Greek yogurt. Thanks for writing. That’s a nice looking ricotta, has it tempted you to have a go at making other cheeses? It’s not as hard as most people think and very rewarding! I also end up with a lot of whey post-yogurt straining and was wondering if I could freeze it to make some ricotta when I need it. Yes, you may freeze whey. It will keep for at least a month just in the refrigerator. Actually, I’ve made very nice ricotta from heating milk with a couple of teaspoons of lemon juice (an acidifier) and following same procedure. The whey left over from the Greek-style yogurt-draining process is an acidifier causing the proteins to coagulate and separate. No reason not to use whey – especially if it’s already in your fridge – but you do end up with MORE whey – and it can take up a lot of space. Yes, Nancy, You are absolutely right. I have made it with lemon juice myself. But for those of us who make lots of Greek yogurt, whey is easier to come by than lemons or buttermilk. I throw the whey from making ricotta away (or over my acid-loving plants.) My Greek yogurt easily generates half a gallon or more of whey every week so you can see how I am quickly overrun with the stuff if I were to keep it all. Thanks for writing. Most people don’t make their own Greek yogurt so it’s nice to have anther alternative. lol…now I know why this recipe didn’t work for me before… I never saw that you had to mix the whey with MILK! 🙂 Thank you!! I’ve never seen it anywhere myself. I just knew that boiling the whey by itself did not produce enough ricotta to make it worth it. Not even close. People had told me it worked–but it didn’t for me. So since whey and buttermilk are often interchangeable and many people make ricotta with buttermilk and milk I decided to try substituting whey for the buttermilk and it worked. EUREKA! And besides being fresh, it costs about half what you would pay for ricotta in the store if you count the whey as free. Can’t wait to try this!! I knew there was a reason my job was cancelled today!! Thanks, Paula, for all you do!